With a house of this size, its beautiful landscaping and manicured back yard that goes on forever, the word that comes to mind is estate. The home’s original outdoor living structure was an attention-grabber in its day, and we can be certain the family has spent many enjoyable hours on this deck. However, styles have changed; the natural cedar deck and stairs showed extensive wear and the deck was in serious need of some shade! Enter Archadeck of Columbus to put things right again. Our mission was to restore the deck, staircase and landing to their former glory — only better — and add a grand pergola for shade. What do we mean by better? 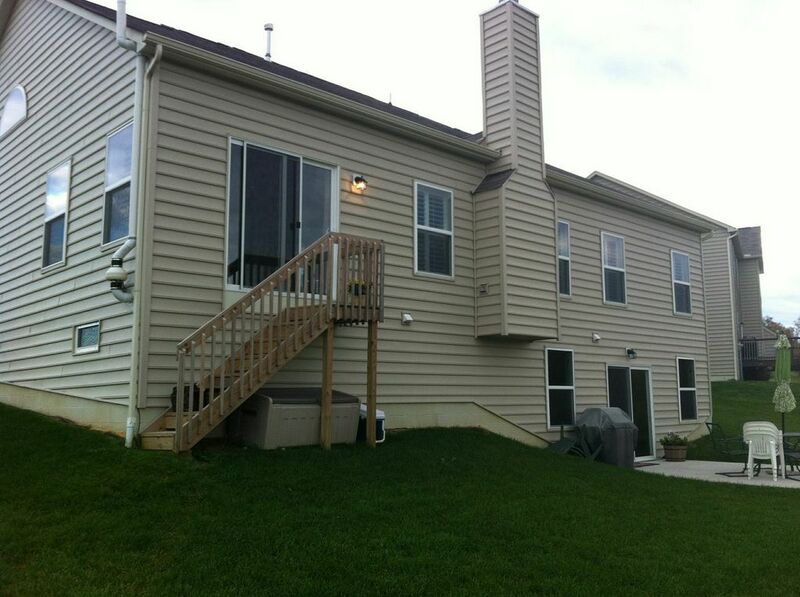 First, better for these homeowners means their deck has now been rebuilt with TimberTech Legacy composite decking. 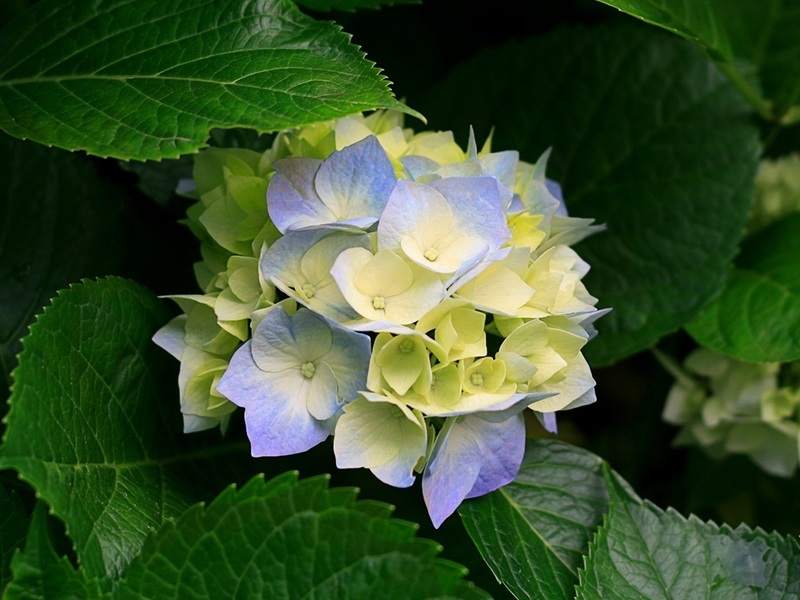 This is an excellent choice for the low-maintenance outdoor living lifestyle. The new deck will not need to be sanded, stained or re-sealed; nor will it show the signs of wear you see over the years with natural wood. The TimberTech color the homeowners selected for their deck is called tigerwood. We’ll let you in on a little secret. We did not have to rebuild this deck from scratch. The original support structure was in very good condition, still structurally sound and capable of supporting the new deck. That’s especially important because composite decking is heavier than wood. So what Archadeck of Columbus actually did here is called redecking. We removed the deck’s original surface and railing system and replaced the cedar boards with composite boards from TimberTech. Next, better means an updated railing system. The original railings were quite sturdy but, compared to today’s railings, they looked clunky — especially the way they were bolted to the outside edge of the deck. Compare that to the new vinyl railing system. It’s just as protective but elegant and much less obtrusive. The light tan railings provide a subtle contrast to the tigerwood color of the decking boards. Because the deck extends all the way across the back of the house, literally from one end to the other, you’re going to see a lot of railing. All the more reason to select an elegant railing system. A single design change here creates a huge visual impact. Following the railing down the sweeping staircase, you may notice that the new stairs include risers, the vertical boards that connect each step to the one above it. The addition of risers is a design technique that seems simple but creates a polished look. Finally, better means the family now has a shaded area for dining on the deck. 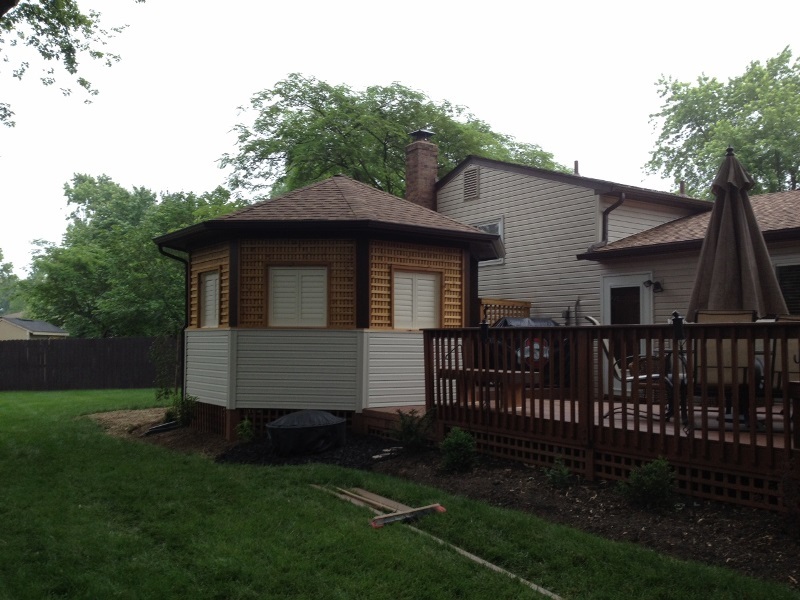 We designed and installed a tan vinyl pergola to match the deck’s new railing system. The pergola is large enough to shade the biggest section of the deck, which contains the dining table. Altogether the redecking project enhances the entire back side of the house. As you can see, the deck, pergola, stairs and landing make up a portion of the home’s entire outdoor living space. There’s also a grill and another seating area under the deck, a patio featuring a fire pit, a handsome retaining wall and a large swimming pool. 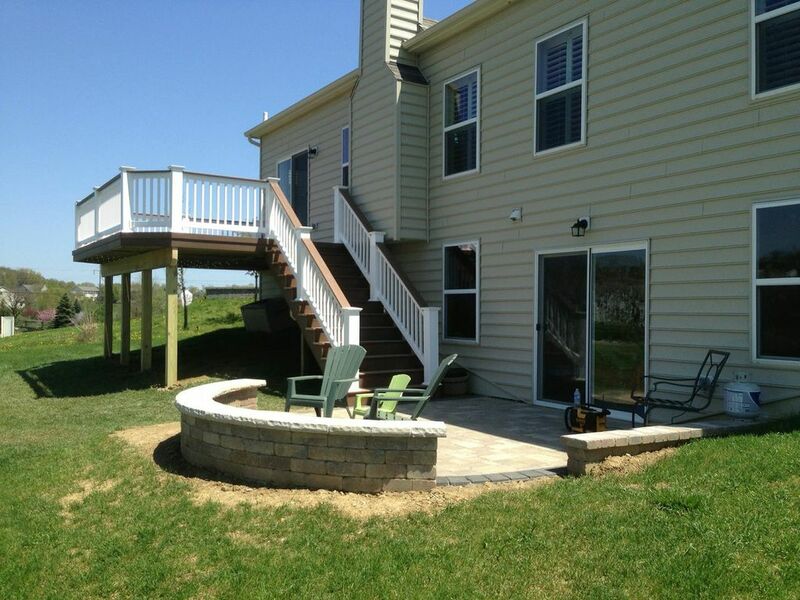 Archadeck of Columbus is proud of the way the new deck helps transform this home from stunning to amazing. The Archadeck of Columbus team. Your Archadeck of Columbus design consultant is ready to help you explore options for updating and transforming your outdoor living space — or creating a new one from scratch. Contact us today at (740) 879 – 3730 or email us at westcolumbus@archadeck.net. 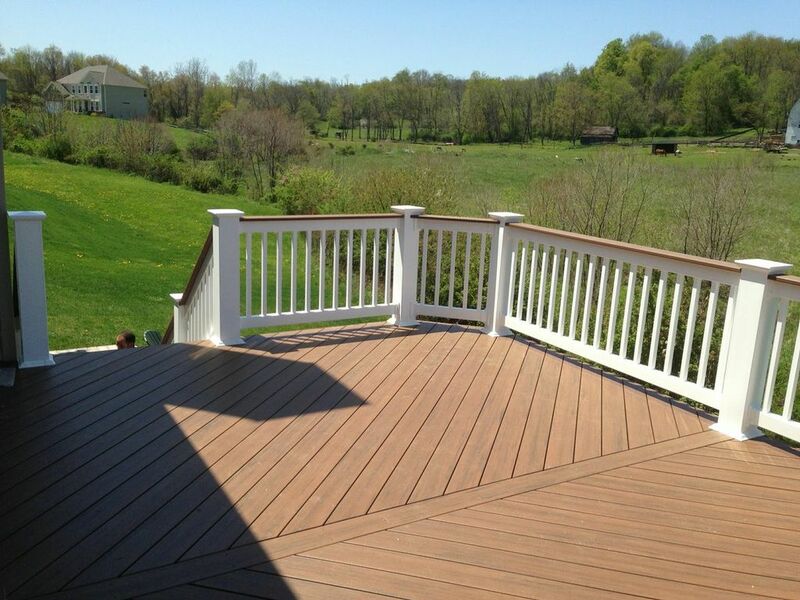 Archadeck of Columbus just completed a backyard transformation in Vinmar Farms, a neighborhood located in Galena, Ohio. When we originally met with the homeowners they had recently purchased the home and their existing outdoor living space consisted of only an 8x 10 builder grade deck. Not only was the deck small it created a boxed in feeling of not being able to turn around in the space, and it offered no access to the backyard from the deck itself. In order to enter the backyard you had to do so from the main level of the home. Since the home included a walkout basement, not having access to the backyard from the deck was an issue they wanted to rectify. When we met with the homeowners to discuss upgrading their outdoor living space there was another prerequisite we needed to address. Aside from all the reasons associated with the size, flow and functionality of the existing space. The homeowners, being caring dog owners, wanted a space that would give their beloved canines, and themselves, an open space to spend time outdoors together and separate. The final design we came up with speaks to all their concerns through a new (much larger) low-maintenance deck, spacious Unilock patio and under-deck space that could provide a shady spot on those dog day afternoons. The entire space flows from one into another and offers access to the backyard AND walkout basement. The deck is built in durable TimberTech Terrain in brown oak, this color is not only easy on the eyes, it also helps mask any dirt brought onto the deck by muddy paws. The deck also includes a white vinyl rail with a TimberTech rail cap which unifies the design. We used a three-board tread step approach to the stairs to make travel up and down into and from the deck into the yard easier for the homeowner’s aging dogs. Just a gentle walk below the deck is the stunning curvilinear paver patio which opens up the outdoor living space possibilities for man, and man’s best friend. The patio is built with Unilock Beacon Hill Flagstone pavers in platinum with a sailor course edge in Unilock Basalt Courtstone. The patio is finished off with a cropped rotary wall of Ledgestone which compliments the edge of the patio and adds a custom touch to the entrance into the walk-out basement. As you can see, the patio floor extends the length of the under-deck area to provide a shady spot for the homeowner’s dogs to relax on warm days. The homeowner’s plan to add low-profile outdoor furnishings to help make the under-deck area easily accessible for the dogs too. The entire space is built with pet-friendliness and extended outdoor living capabilities in mind. The homeowners are elated with their new backyard, as are their dogs. We look forward to revisiting this project in the months ahead and capture images of our four-legged clients enjoying the space too! If you are ready to extend your outdoor living possibilities, for all members of your family to enjoy, Archadeck of Columbus can help! We can address any special circumstances and expertly refine an outdoor living space to address those needs. Contact us today to learn more at (740) 879 – 3730 or email us at westcolumbus@archadeck.net. This Outdoor Living Combination in New Albany, OH, Gives New Meaning to Backyard Bliss! One of our most recent completed projects took us to beautiful New Albany, OH, where we total transformed the backyard and outdoor living potential for these amazing homeowners. Their journey to fulfilling their wish for a new and improved outdoor space began by contacting Archadeck of Columbus. When we initially met with these New Albany, OH, homeowners for their consultation, their existing outdoor living space consisted of a painted wooden deck. The deck, in itself, was not complimentary or scaled to accentuate to their home or their landscape. The main concern expressed by the homeowner’s was their desire to have more outdoor space to entertain, and a space to provide shade on those hot summer days. With this in mind, our talented design team went to work on coming up with a multi-faceted design that would address the clients needs and deliver a new & improved look and feel to the backyard! Amazing before & after images of this project. The new outdoor living space combines all the function, beauty and versatility the homeowner’s had in mind, and much more. This outdoor living combination includes a new deck, paver patio surround with a shade pergola, custom fire pit and a seating/retaining wall. Archadeck of Columbus also designed and installed the landscaping as the perfect finishing touch to the outdoor structure additions. The Paver Patio encompasses and blends the entire space from the moment you enter from the rear of the home, or step off the deck. The patio was built using Unilock Beacon Hill pavers in Sierra with a Holland Stone soldier course border in Charcoal. The Deck was built using a low-to-grade design providing a seamless transition from one space to another in low-maintenance TimberTech in Pacific Rosewood. This beautiful color was recently discontinued from the TimberTech line, so Archadeck of Columbus diligently searched to ensure the needed materials were within our reach as we began the project. The railings used on the deck were powder-coated aluminum and we also integrated deck lighting into the design to enhance evening functionality and ambiance. The Fire Pit delivers extended enjoyment for the homeowner’s to gather with family and friends for conversation, or even s’mores! The retaining wall helps define the area and adds additional seating when entertaining a crowd. The fire pit and wall were built using Brussels Dimensional pavers with a ledgestone cap and accent banding within the seating wall to unify the color used along the patio’s edge and for added visual interest. The Pergola adds the shade qualities these homeowner’s wanted while adding beauty to the entire project. The pergola is made of low-maintenance vinyl and is constructed with angled lathing to deliver additional sun-blocking benefits. The Landcaping/Softscaping is last but certainly not least, as it serves as the perfect finishing touch to the entire outdoor living space. Archadeck of Columbus carefully hand-picked select perennials that would work best in this backyard and to compliment the design elements of the new outdoor space, and the homeowner’s personal tastes. Softscaping is the pièce de résistance to many of our projects and it adds a signature flair and seasonal color. If you are ready to transform the way you live outdoors through the addition of a singular or combination outdoor living space, contact Archadeck of Columbus today to get started! We would love the opportunity to work with you on your anticipated outdoor structure project. You can reach us at (740) 879 – 3730, or via email at westcolumbus@archadeck.net. Author archadeckofcolumbusPosted on July 6, 2016 July 6, 2016 Categories Archadeck of Columbus, Combination outdoor structures design, Composite decks, Hardscapes, Landscaping, Outdoor fireplaces and fire pits, Patios & hardscapes, Paver Patios, Pergolas, TimberTech decksTags Archadeck of Columbus, Columbus deck builder, Columbus decks, Columbus OH hardscape designs, Columbus OH Patio Designs, Columbus OH Paver Patios, New Albany OH Deck Builder, New Albany OH Fire Pit Builder, New Albany OH Paver Patio Builder, New Albany OH pergola builders, outdoor living, Patio and deck combinations, Paver patios ColumbusLeave a comment on This Outdoor Living Combination in New Albany, OH, Gives New Meaning to Backyard Bliss! Archadeck of Columbus will be at the Dispatch Home and Garden Show beginning this Saturday! Archadeck of Columbus will be at the Columbus Dispatch Home & Garden Show at the Ohio Expo Center 2/22 thru 3/02. Come see us and let us help make your outdoor living dreams a reality this season! If improving your existing outdoor living space or adding a new one is something that has been on your mind, we know how you can learn more about both! Archadeck of Columbus will be at the Columbus Dispatch Home & Garden Show at the Ohio Expo Center.The show begins on February, 22nd and runs through March, 2nd. Spring is right around the corner and now is the time to start planning for your outdoor living space addition! A look at our new booth for the Columbus Dispatch Home and Garden Show. Our new booth is filled with inspiring outdoor living space design ideas you can not only see, but touch and feel. We will be featuring a 10 x 20 booth in the Celeste Center where we will share a custom TimberTech deck design featuring their newest capstock product introduction, EarthWoods Evolution Legacy. We will showcase white vinyl railings with black aluminum pickets in conjunction with this low-maintenance, high-aesthetic deck, which are very popular right now. Above the deck we also feature a white vinyl pergola integrated within four (4) Unilock hardscape pillars. Stepping down into another section of our display will bring you into our hardscape area which features Unilock Enduracolor pavers, a custom planting wall and fire pit. As our backdrop we are using cedar screening which will feature pictures of past projects to give homeowners ideas and inspiration for their own outdoor oasis! Our booth will highlight a stunning deck and pergola combination,a Unilock patio and much more! The home and garden show is an event designed for homeowners in all stages of remodeling, landscaping and decorating their homes. If you’re thinking of adding or amending your outdoor living space, or an outdoor room addition, this is the home show you can’t afford to miss. No matter what you have in mind for home improvements, you’ll find the right products and the best companies at Columbus Dispatch Home & Garden Show, one of the largest home shows in the region. Talk to the experts and find just the right designs at just the right price for your home improvement budget. Spring is right around the corner and this is the home show you can’t afford to miss. Come by and see us while at the home show, you won’t be disappointed. Whether you are a new homeowner, or someone who has lived in your home for years, anyone with an interest in updating, enhancing, or creating a new look or amenity for their home will enjoy the Home Show. We will be offering a special discount of $250 off of any project of $5,000 or more for this show only! We will be located in the Celeste Center in booths #5023 – #5025, and our talented team of designers and builders will be on hand to answer all your questions and help you begin living your outdoor living dreams. The Ohio Expo Center (Ohio State Fairgrounds) is located at 717 E. 17th Ave. in Columbus. Admission for the event is $12 at the door or $11 in advance . On Tuesday, Feb. 25, bring your home electric bill and get buy-one, get one free tickets at the door, courtesy of AEP Energy. On Wednesday, Feb 26, and Thursday Feb. 27, save $3 off two tickets at the door when you present your home electric bill, courtesy of AEP Energy. Friday, Feb. 28, is AAA Show Your Card and Save Day, when you can get $3 off on up to two tickets by showing your AAA card at the door. westcolumbus@archadeck.net We look forward to seeing you at the show! Author archadeckofcolumbusPosted on February 19, 2014 February 19, 2014 Categories Archadeck of Columbus, Combination outdoor structures design, Hardscape designs, TimberTech decksTags Archadeck of Columbus, Columbus deck and pergola combos, Columbus deck builder, Columbus Dispatch Home & Garden Show, Columbus fire pit builder, Columbus fire pits, Columbus hardscapes, Columbus OH home shows for outdoor living ideas, Columbus OH homes and trade shows, Columbus OH TimberTech decks, EarthWoods Evolution Legacy, The Ohio Expo Center, Timbertech, Unilock Enduracolor paversLeave a comment on Archadeck of Columbus will be at the Dispatch Home and Garden Show beginning this Saturday! 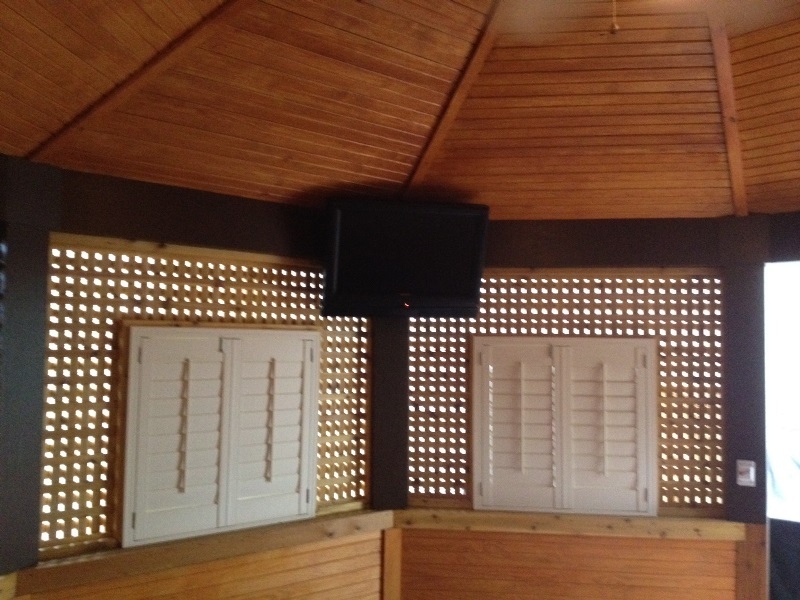 Archadeck of Columbus takes a peek inside a one of a kind custom gazebo and deck combination project we just completed. This image depicts our initial design for this Columbus outdoor oasis. Our most recent project is located in Columbus, OH and incorporates an outdoor living design that defines thinking out of the box. 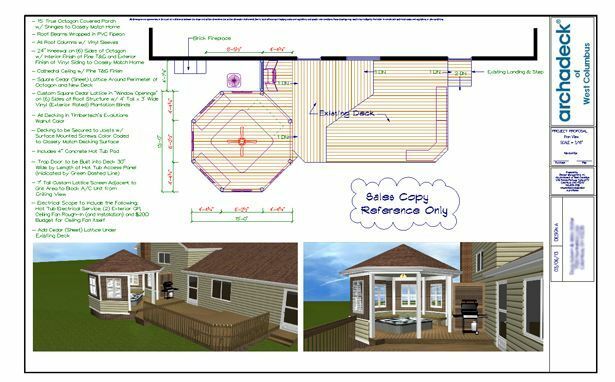 These homeowners contacted Archadeck of Columbus to explore building an extension onto their existing deck as well as a custom gazebo addition to house their hot tub. By making their deck space larger and building a specialized area set aside for the hot tub, the homeowners wanted to add functional space and a private place to enjoy the hot tub. design their outdoor oasis.We began by extending their existing deck and re-decking the area with low maintenance TimberTech Earthwoods Evolutions decking. This same decking was also used in the floor of the custom gazebo addition. The homeowners chose to use the beautiful Walnut color flooring as it adds a deep, rich feel to the entire addition. The Earthwoods Evolutions line of decking from TimberTech works great on pool and spa decks because it is capped with a protected polymer shell. The plank is resistant to the elements and everyday accidents endured by most decks. Earthwood Evolutions’ 25-year Fade and Stain Warranty also gives homeowners total peace of mind. 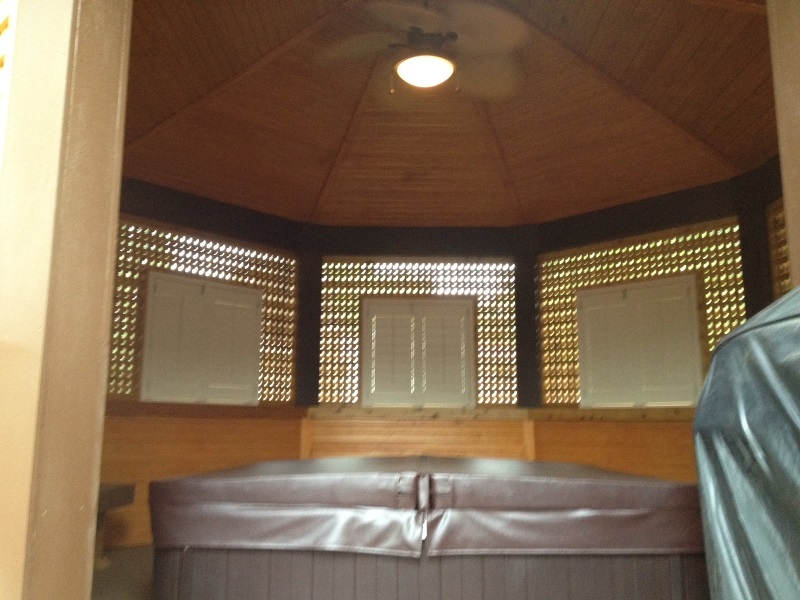 The spacious 15 x 15 custom gazebo includes a luxurious recessed hot tub. Opting to recess the spa not only increases ease of access when using the hot tub, it also gives the interior of the gazebo an open feel. 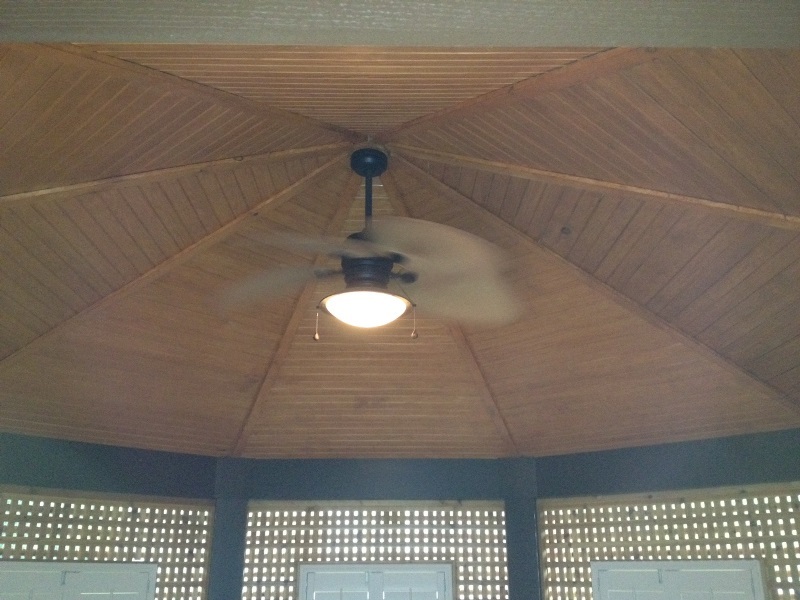 The gazebo is built in a unique octagonal shape. We installed a 24″ knee wall on all angles (minus the door). What’s better than a hot tub gazebo? How about having a Buckeye grill cover on your adjacent grill!! 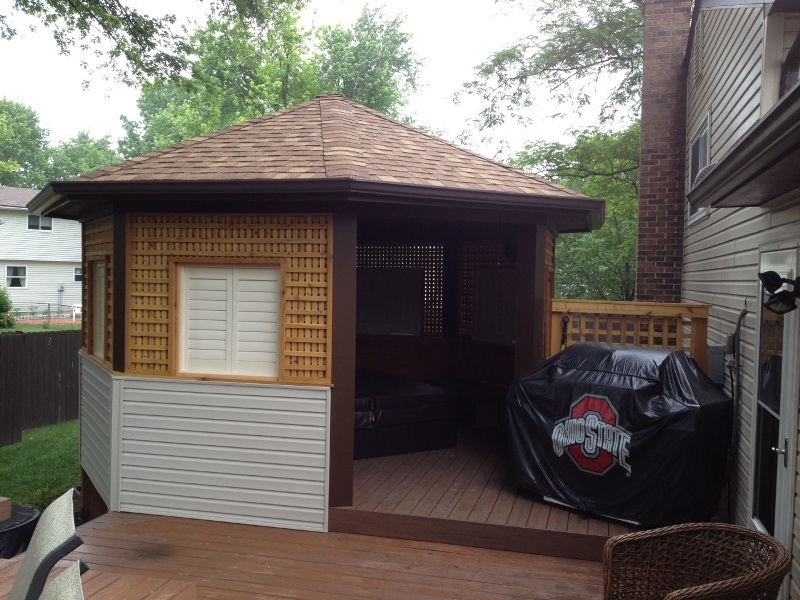 We kept the gazebo original to the home by matching the shingles we used to the ones on the home, and we also matched the exterior vinyl finish to the vinyl used on the home. Archadeck of Columbus took the custom look a step farther by wrapping the gazebos’ columns with beautiful Paulownia hardwood and installing lattice around the openings of the gazebo which have plantation shutters. The use of lattice on the gazebo gives the space an Asian feel that is ambiguous to the Zen inspired outdoor spaces readily seen in upscale home and garden magazines. This outdoor living space clearly defines an area inspired by the principles of Zen, which involves a total state of focus that incorporate a total togetherness of body and mind. Zen is a way of being and a state of mind. From the open deck to the tranquil gazebo interior specially designed for relaxation and renewal, this project takes comfort to a whole new level. Don’t forget the flat screen TV in your ultimate soaking oasis! You can see more unique outdoor living space designs by visiting our gazebo photo gallery and our pool and spa deck photo gallery located on our website. A deck, patio and fire pit combination outdoor space is just what these Granville, OH homeowners had in mind. This new outdoor space gives the rear of this Granville, OH home new direction. Our featured project this week proves the power of adding a quality designed and built outdoor space to your backyard. This relatively new home only had a small concrete landing. When we met with these Granville homeowners, we discussed adding a larger and more usable outdoor living space. The existing area had stairs that led to the home’s upper level. They also had a door outside their basement that sat at a lower grade. Their desire was to add two outdoor living spaces to extend their backyard enjoyment. They were also certain that they wanted a fire pit with a seating wall. This image shows the backyard area before we began the project. Archadeck of Columbus headed to the drawingboard to design a space that would meet their needs and fulfill their wishes. We came out with a combination outdoor living space that includes a low maintenance deck and new patio complete with the fire pit and seating wall. The deck was built with TimberTech Evolutions decking in walnut. This choice ensures the authentic look of natural wood but requires minimal maintenance to stay looking great for years to come. We wanted to tie the trim color of the house into the space so we used white vinyl railing. The contrast between the walnut deck and the white railing is clean and crisp. We also recommended TimberTech rail camp on the vinyl railing to allow a flat surface. Normal vinyl railing will not allow for this feature since they are often rounded. The rail camp adds another layer of aesthetic to the space. Notice how beautifully the Walnut TimberTech Evolutions decking compliments the whote vinyl rail and rail camp. In addition to the new TimberTech deck, we removed the existing concrete patio and replaced it with a nice curvilinear patio with a retaining wall that also serves as a seating wall. We then integrated a wood fire pit within the seating wall. This design includes a retaining wall next to the house. This small retaining wall is both functional and attractive. Archadeck of Columbus constructed the hardscape components with Unilock‘s Brussels in the Sierra color. We also added a soldier course with an Il Campo charcoal colored border. For the retaining walls we used Unilock’s Brussels dimensional stone which is typically used for walls since it is a larger sized hardscape medium. The fire pit’s unique design is functional yet unobtrusive. We included Unilock Ledgestone as a decorative cap, and carried the same cap throughout the seating wall. 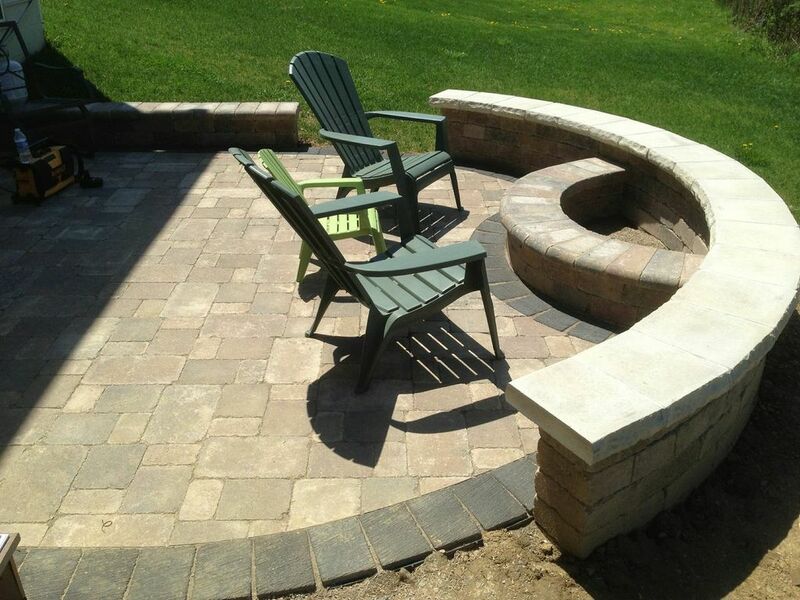 We designed the custom fire pit into the retaining wall so it becomes one with the wall. For a relatively small space, the fire pit doesn’t take up a lot of functional, usable space. In addition to the deck and hardscape area, we also installed an extra column to support the stairs. This is our protocol with any set of long stairs such as this. This is to alleviate movement and bouncing, which will not occur with the additional support we installed. These Granville homeowners are elated with their new space. They hosted an outdoor party last weekend where they were able to use (and show off) their new outdoor oasis! They are looking forward to the spring and summer season to have more opportunities to utilize their new space. You can see more examples of our low maintenance deck designs and out patios and hardscapes by visiting our composite and PVC deck gallery and our patio and hardscapes gallery, located on our website. Archadeck of Columbus unveils the TimberTech additions for 2013, Terrain decking and Feeney Cable Rail. These two additions mean more choices and more beauty can be yours with a custom outdoor space from us. Just when we thought the TimberTech product line couldn’t get any better, there is a new introduction to their new line of synthetic decking called TimberTech Terrain. Terrain is a wood and plastic capstock product that is similar in many ways to the popular Earthwood Evolutions line. The Terrain line features a thinner profile, similar to the TimberTech Reliaboard line, but with the same attributes that makes homeowner’s flock to the Earthwood Evolutions line at about 30% lower cost. This picture shows both colors of the Terrain line. Capstock is a term that depicts a synthetic board with a composite core which is wrapped (hence the term capped), with a PVC shell. According to a press release from TimberTech “In its second year, Earthwood Evolutions continues to exceed expectations for aesthetics and scratch, stain and fade resistance, said Toby Bostwick, director of product management for TimberTech. “From the Terrain Collection, customers can expect the same high performance qualities, backed by the same 25-year fade and stain warranty as our other Evolutions planks.” This means more of a good thing from the TimberTech line. Terrain comes in two neutral colors; Brown Oak which is a deep brown, and Silver Maple which is dark gray. Both these new colors were formulated to complement any of the other TimberTech products and their vast color palettes. As with the Earthwoods Evolutions, we also have the ability to conceal lock fasteners so you won’t see any fasteners providing a clean, cohesive appearance. With the new introduction of the Terrain line, TimberTech also joins forces in 2013 with Feeney Cable Rail. These railings are very desirable because they deliver an unobscured view in your outdoor space. The same aesthetics that have made the design of the “endless pool” so popular among pool owners is the same design basis with Feeney cable railings. Both provide a clear view into your landscape and backyard. The concept really opens up a space, allows for more visual interest, and makes your outdoor space appear more spacious. Feeney is a significantly higher-end product but customers agree it is worth it for the added beauty it provides in your outdoor space. RadianceRail in the style of Feeney Cable Rail, endless views and endless beauty. Archadeck of Columbus looks forward to the opportunity of using these new TimberTech additions in the field in 2013. More choices and diverse options always make for a happy customer! Visit our composite and PVC (vinyl) deck gallery located on our website to see more stunning examples of TimberTech decks and railing options we have available.